Home » How to Register for SAP Certification? How to Register for SAP Certification? How to Register for SAP Certification? Step-by-Step Guide. 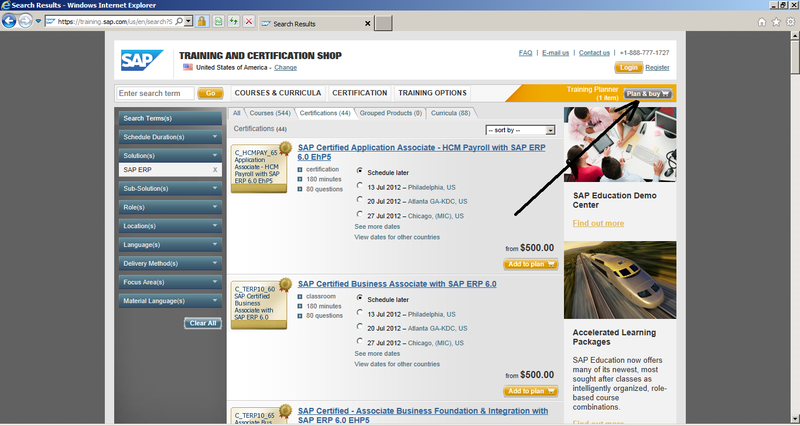 In this article we will explain how to register for SAP Certification exam. We will go step by step through the registration process and illustrate each step with a screenshot. The registration process does not seem to be difficult, but still a lot of people ask how to register for SAP certification test. That was our main motivation to write this article. Welcome to the SAP world! You decided to become a certified SAP consultant and it is a good way to start your career in SAP area. In this guide we assume that you have already taken appropriate SAP training course, practiced with SAP certification sample questions, fulfilled certification prerequisites, and are ready to try yourself with the certification. Our guide will be focused on registration for SAP Certification in United States through SAP website (online). 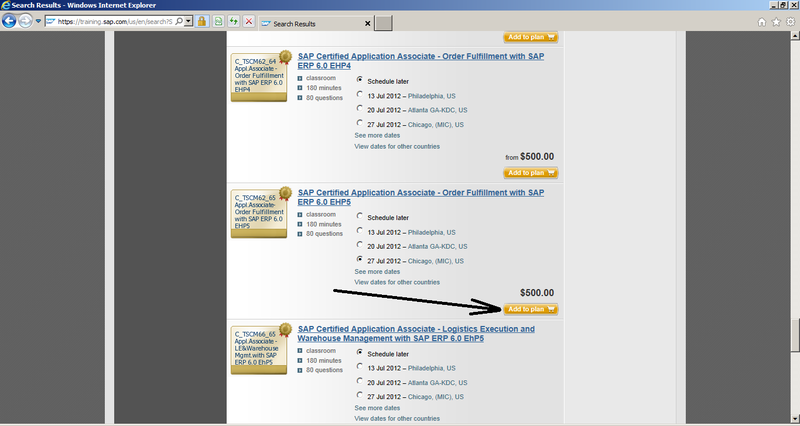 So far it is the most convenient way that is offered by SAP. Registration in other countries is almost identical with one big exception: there are countries where online registration is not yet implemented. If you want to get certified in one of these countries you should contact SAP Education by phone. 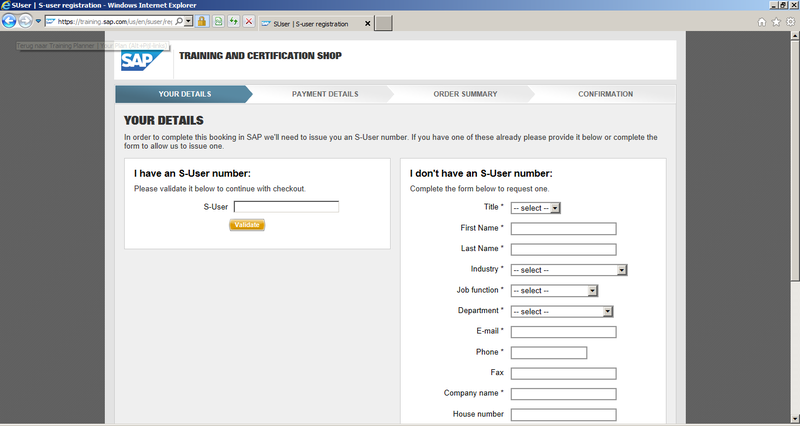 We will talk more about registration by phone in the section Offline Registration for SAP Certification (see below). 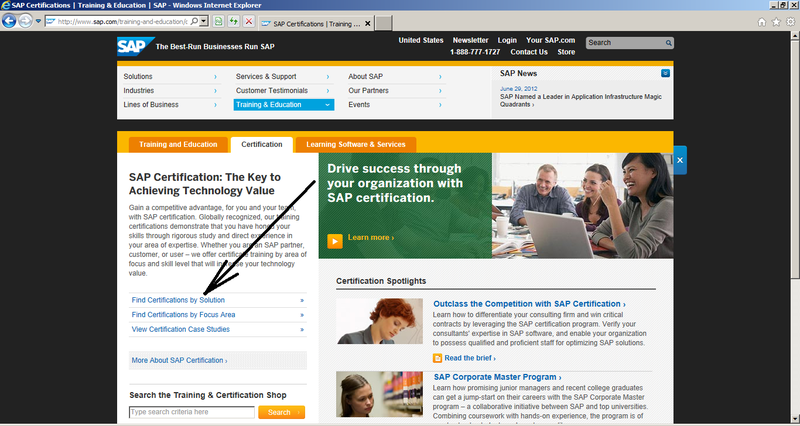 If you do not know whether it is possible to register for SAP Certification online in your country, follow the guide for online registration and you will very soon find it out. Here you should choose the desired location and language. When you are done, click Continue. If you have already visited this website before, you can probably skip this step because you set your location and language earlier. 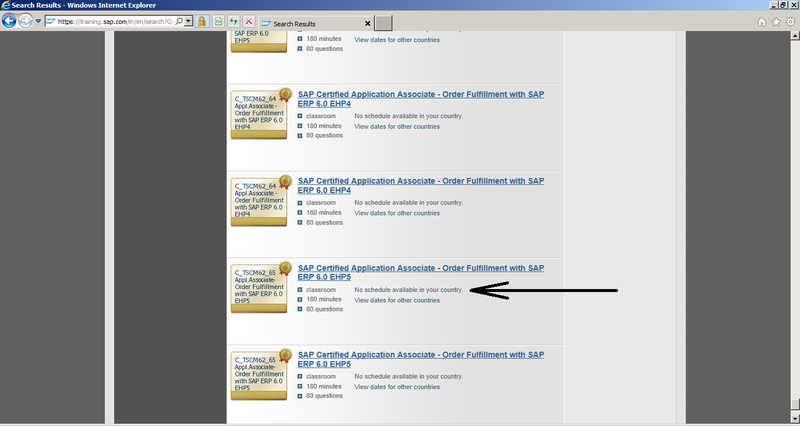 Step 3: Now you need to choose for which SAP solution you would like to certify. In most cases people register for solution SAP Enterprise Resource Planning – ERP, because currently it is the primary SAP product and it creates the largest number of jobs. Then in the list with various certification, you should locate the desired one. 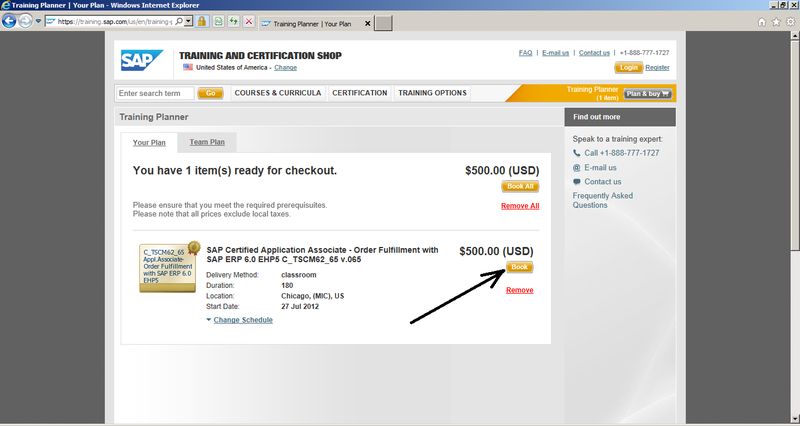 Step 4: Let us assume that in this tutorial we want to register for SAP SD Certification, which is going to take place on 27th of July 2012 in Chicago. Step 5: On the checkout page you should simply click Book button. 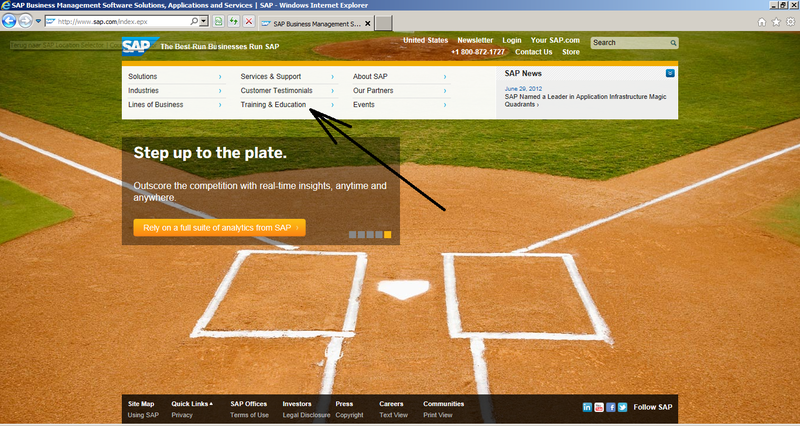 Then SAP will offer you two opportunities: either create an account on their website or proceed as a guest. In this guide we will proceed as a guest, but if you wish, you are welcome to create an account for SAP website. It certainly will not harm. On the next page you will be asked to enter your S-user number or offered with an opportunity to create it if you do not have one yet. On the next page you will be asked to provide payment details. 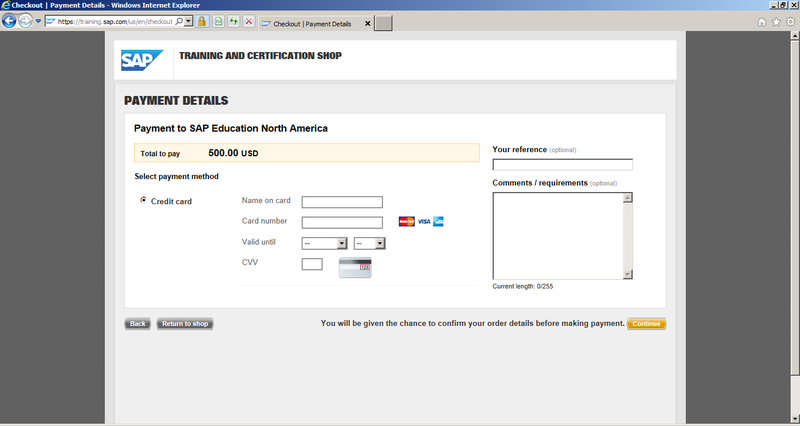 You can pay for SAP certification with credit card (Visa, MasterCard, American Express). It is possible that the available payment methods vary depending on a country. So you might also be able to pay with one of your local payment methods. As soon as you fill in your payment data, click on Continue button and you will have one more chance to review your order. If you agree with everything, you should confirm the order and complete the registration. You will shortly receive an e-mail with confirmation of your registration. It is a good idea to print this confirmation out and take it with you for the certification. Congratulations, you are done! And good luck with your certification, we are sure you are going to ace it :). You see that instead of the nearest dates and locations the webpage says No schedule available in your country. What then you should do? Unfortunately, it is necessary to contact SAP Education directly by giving them a phone call. You can find their phone number in the top right corner of the page. For example, in India their number is +91 080 4082 90 00. So just give them a call and an operator will guide you through the process of registration for SAP Certification. We hope that we’ve answered how to register for SAP certification. Do you still have questions? Something is unclear? Let us know with the comment box below! I have three years experience in SAP MM module. I would like to do certification course. I am in brampton, Canada. Kindly mail the details of SAP authorized centre in brampton for taking the certification course. I think the closest one is in Mississauga. Try to check here: http://www8.pearsonvue.com/Dispatcher?application=VTCLocator&action=actStartApp&v=W2L&cid=407. Let me know if you have problems locating it! Good luck with SAP certification! Is pearsonvue offering training course on SAP MM certification also ? 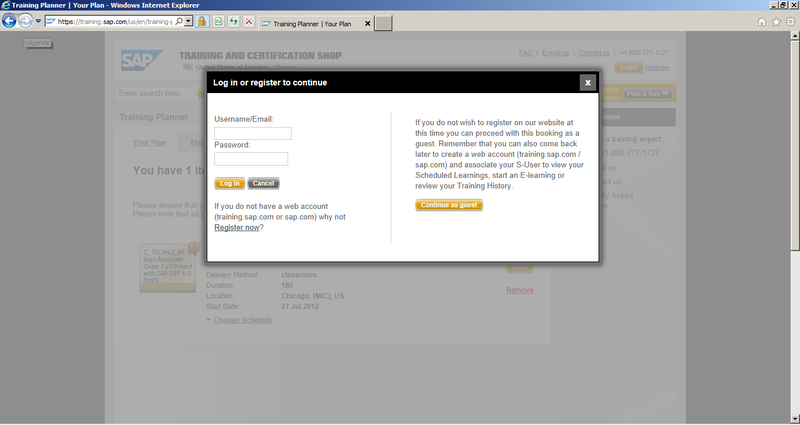 If I register online, will I get study materials and SAP user id ? I am Hemant. I’ve just completed my ABAP learning from a institute and searching for a job, but everywhere certified SAP consultants are needed. While filling the form of S-User number they require “company name” and I’ve not worked in any company, what should be the next step in my case. please help me with a solution. Then, I would propose to put ‘N/A’ instead of the company name. This would mean ‘non applicable’. Try it and let me know how it worked out! Sure Cleo, thank you so much. I am planning to take up certification for C_GRAC_10.I have 3+ years experience.I would like to know if there are any authorised centers in India to take up the exam. I am interested in doing a SAP Course with certification from Canada. I have 5 years of experience in Sales in India.I am an engineer + MBA in Marketing. 1) Is there any SAP course available in Canada for around 6 months. 2) I am currently in India, will the center/institute help in getting visa and all. 3) What are the Job prospects in canada after completion of course and certification. Hi, I was using SAP as end user and now I am intersted to get the training courese online. Kindly assist me as I am a new user and want to learn SAP full moduel. What time it will take and can it be taken online? Hi – I have certified twice in a module – once as an independent and once whilst working for SAP. How do I get an S-number – I need it to look for notes etc. Is the exam available only by following this certification process or can I study from a book myself and pass the test? 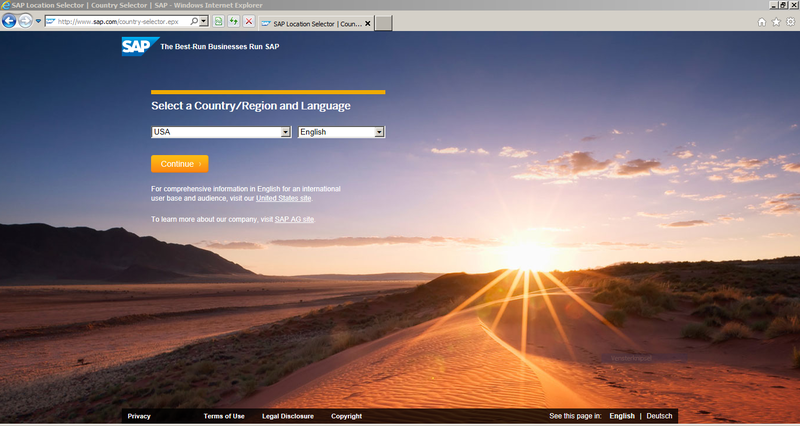 It depends on a country because SAP has different rules for different regions. In most of the countries you can simply study from a book yourself and pass SAP certification. 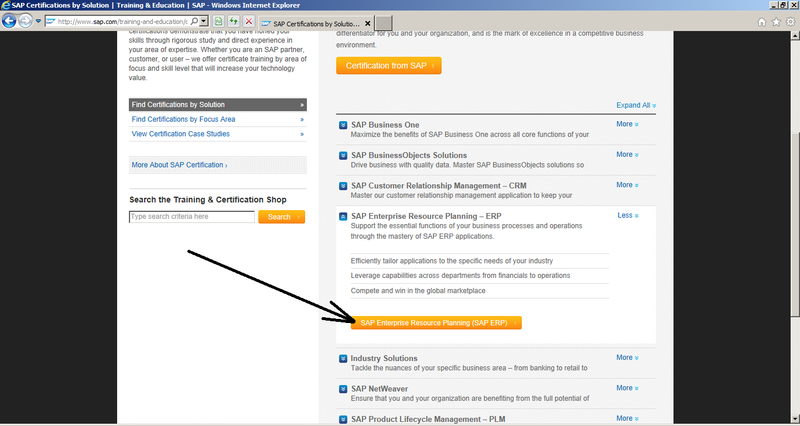 Please read this post: SAP Certification Requirements. 1st of all let me say that you are doing a great job providing help to all SAP aspirants 😀 kudos to that. I am graduate with accounting degree. Now my questions are 1) with accounting background is it good choice to break into consultancy field with sap fico certification? 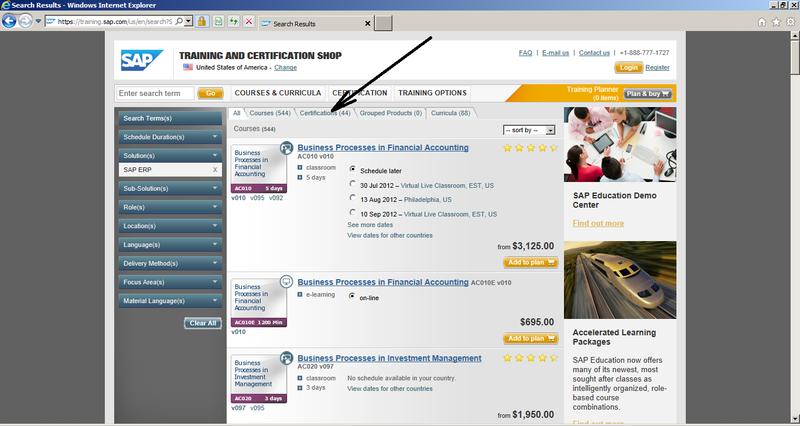 2) as i am planning to attempt the sap fico certification exam, my accounting background will be helpful in any way? Can you tell me how to get S user id password. I have done my SAP certifcation in FI and SAP Business one. Please refer to this article: How to Get SAP S User ID. what the good courses of SAP will be benefit for me I am doing supply chain management and business management? I want to know if it is required to have hands on experience in SAP to register for exam? Please suggest me without attending SAP course can i give SAP exam. What is a procedure to become Auterised SAP training Institute? Can you please forward me a link related? Please have a look here: SAP MM Questions. Iam sreenu i had completed sap sd module and how to get sap certification and what are the centres in india. I am working in Oil & Gas construction field. Looking to go as Data analyst/ Analytic or Business development person in Oil & Gas field but into Big Data/BI field. For that I m looking for a training in BI to enter in this field . how much it will be charged. I have 2 years & 8 months of work experience in SAP (Accounts payable) R-3 version. And I want to learn FICO module. Is we have the scope in FICO module? If not then which module should be suitable for Accounts. & this will make my career. I am MBA student could you please suggest me that which cource is suitable for me? i am from Pakistan and sap SD certified , can i take test for sap CRM certification, and what is the requirement. I have done my SAP OS/DB Migration certification for Netweaver 7.30, but I can’t remember the S-user id I used to get the certification. I have my certification copy and also the certification ID. How do I get my S-user id or link my certification to my current S-user id? Maybe, you can try to reset your S-user ID by entering your email using this link: http://service.sap.com/reset-pw ? I’m a certified SD consultant in India. Now, I’m looking for certification in logistic execution. 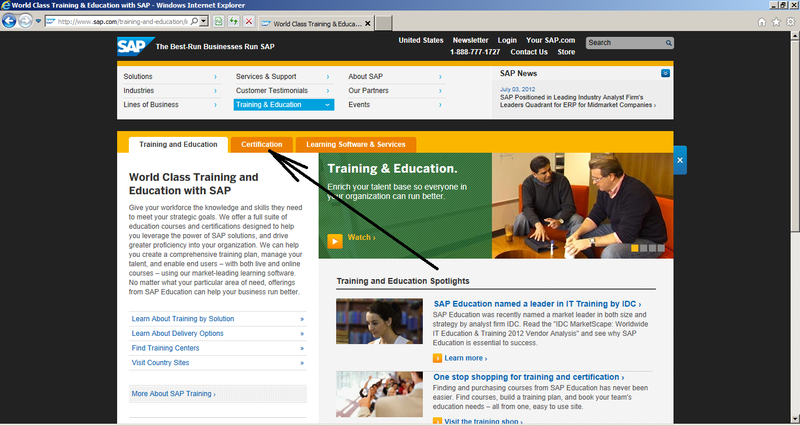 Through my employer, I can access SAP learning hub. Can you please help me to know the process so that I can appear for certification exam. I have searched a lot but didn’t get satisfactory answer so far. Please contact the official SAP Education office in India. I am from india from last 9 years i am working in sap as an end user meanwile i took training of SAP fi implemenatatio from a senior Sap consultant now i want to give sap certification exam . Is there any option through which i can give certification exam. Hi I am Sindhu, I am a Bcom student and i have no domain experience.I am planning to write FI Certification.Am i eligible to write the exam with out any experience in any of the abroad countries? MYSELF MADHAV,I’M TAKING EDUCATION OF SAP MM IN PRIVATE INSTITUTE THIS IS NOT SAP AUTHORISED INSTITUTE,IF I COMPLETED THIS & I WANT SAP AUTHIRISED CERTIFICATE ,IS IT POSSIBLE TO GIVE EXAM ONLY FILL EXAM FEES IN YOURS AUTHORIZED INSTITUTE? How can I do this India. please help. I have 9 years experience of working as a SAP BI/BO consultant . But I am not working currently in US with work authorization. 1. Can I keep the company name blank (N/A) and apply for S-user id? 2. I am currently in USA, can I appear in the C_HANAIMP_15 exam on cloud or should it be in a Pearson Vue Center? I have been using SAP for over 5 years,, am experienced in SAP MM, SD; how can be a certified SAP MM consultant as well as certified on SD, PP? I would like to register to SAP MM.